Give Kids a Chance Charity Inc. exists to relieve poverty by providing basic amenities (food, registration fees, and basic supplies) to economically-disadvantaged children. Incorporated in 2006, GKACCI is governed by a Board of Directors who identify participation barriers in Saskatchewan and work toward removing them. In Saskatchewan, a growing number of children are living in poverty and face barriers that limit their potential to grow, learn and prosper as adults. 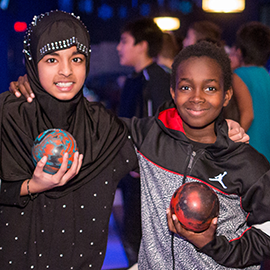 Give Kids a Chance Charity Inc. helps connect Saskatchewan children to inclusive, safe and fun programs, and provides the basic amenities they need to pursue active and healthy lifestyles. Give Kids A Chance Charity helps to remove barriers to participation in sport, culture and recreation for kids through a variety of supports, including: relevant, encouraging role models; access to facilities and equipment; transportation to and from facilities; information on how to play and join in; proper nutrition; positive guidance and leadership opportunities; and more. The work of GKACCI aligns with the Truth and Reconciliation Commission of Canada’s Calls to Action to reduce barriers to participation, be inclusive, support and promote physical activity for health and well-being, thereby ensuring long-term growth and development for Indigenous People. We believe that participation in sport, culture and recreation contributes to the development of healthy lifestyles and life skills. Give Kids a Chance Charity works in partnership with Sask Sport Inc. and community-based organizations to facilitate program delivery, minimize administration costs and maximize contributions. You can help by making a donation, volunteering your time, or becoming a sponsor or delivery partner. In 2017, through the generous support of donors, sponsors and partnerships, Give Kids a Chance Charity helped over 57,000 Saskatchewan children. Chances lead to choices. Join us in creating more opportunities for the kids in our province and donate! Every donation counts and will help make a difference in the 1-in-4 children’s lives who live in poverty. Everyone is invited to help change this statistic by visiting our donation page to contribute. Your generosity will make an impact in Saskatchewan. Corporate and tribute donations are also an option, where you can make a donation in honour, memory, or celebration of someone. Charitable receipts are available and we thank you for your support.